It is a real delight to join you at the fifth China Economic Symposium held by Cheung Kong Graduate School of Business (CKGSB). Seven years ago, I had the honor to attend the Launch of CKGSB’s European office, and have since witnessed your impressive progress. Over the past seven years, you have been true to your motto, namely “to seize the trend, know the way and hone the skill”. You have been persistently devoted to cultivating a new generation of world business leaders . You have not only trained talents for China and the world but also made important contribution to China-UK cooperation on education. Seven years ago, China marked the 10th anniversary of becoming a WTO member. China’s reform and opening up entered a new stage featuring higher quality and better efficiency. First, China has honored its commitments. China has improved the socialist market economy. We have substantially cut import tariffs, significantly lowered non-tariff barriers and liberalized the right to trade. We have opened up the service sector extensively and made persistent efforts to reduce restrictions on foreign capital. We have enhanced IPR protection. The royalties China paid to overseas rights owners have been growing at 17% annually on average, and the number of patent applications has topped the world for seven consecutive years. China has been devoted to enhancing the stability, transparency and predictability of its opening-up policies. Through these efforts, China has established its credibility as a responsible country that honours its commitments. Second, China has displayed its firm resolve. and fully supported the integration of developing countries in the multi-lateral trade regime. Against the surging anti-globalisation sentiments, China has made its position clear: We oppose unilateralism and protectionism, uphold free trade and support open economy. China has taken concrete steps to safeguard the authority, rules and effectiveness of the multi-lateral trade regime. This has provided stability and certainty in a world full of uncertainties. Third, China has shown its inclusive spirit. With its rapid growth, China has been a key engine driving the world economy forward. Through trade and two-way investment, China has delivered benefits to the whole world. As a result, China has become a major stabiliser and powerhouse for global growth. Over the past 17 years, China had contributed nearly 30% to world economic growth every year. At the same time, we have lowered the general tariff level from 15.3% to 9.8%. 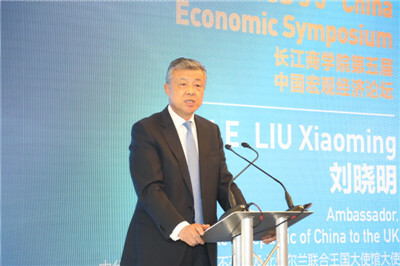 China has provided the international community with various public goods, including the Belt and Road Initiative and the International Import Expo. With these public goods, China is ready to share its development benefits with all the countries in the world, and is in a better position to uphold an open world economy. History shows that globalisation has been the powerful driving force behind world economic growth. Globalisation is an irreversible trend. China’s economic growth has been an experience of following this irreversible trend. It is also an experience of greater integration with the world. Now, China is shifting from high-speed growth to high-quality growth. In this process, China will keep to this trend and open its door wider to the world. and encourage rule-based outbound investment. China-UK relationship has always been a leading example of East-West relationship. As the China-UK “Golden Era” continues to make progress, our relationship has become more strategic, practical, global and inclusive. The first opportunity arises from the changes in the world. The world is now undergoing profound changes unseen in a century. Peace and development remain the theme of our times, but unilateralism and protectionism are on the rise. The United States is provoking a “trade war” around the world. Its act of trade bullying will severely undermine the international trade regime, disrupt the global economic order and hinder the normal development of world economy and trade. At this critical moment, the international community must choose between isolation and openness, between stagnation and progress, and between self-supremacy and win-win cooperation. China and the UK respect each other’s independent choice of development path. Both countries champion openness and free trade. It is important that we should join hands to voice support for economic globalisation and opposition to unilateralism and protectionism. Our two countries should match our development strategies and deepen trade and economic cooperation so as to contribute to building an open world economy. The second opportunity arises from China’s opening up. The Chinese Government will continue to roll out opening-up measures to create a more investment-friendly environment. In the coming five years, China is expected to import $8 trillion of goods and open up a $600 billion market for foreign investment. This means a more promising market and broader cooperation opportunities for the UK. In particular, this coming November, China will host the first International Import Expo in Shanghai. This will be the world’s first national-level exposition that focuses on import only. We welcome the UK to the Expo as a Country of Honor and hope that British companies will take an active part in the Expo. It will be a great opportunity to introduce British products and services to the Chinese market. Together, China and the UK can turn the Import Expo into a new platform for promoting bilateral trade between our two countries. The third opportunity arises from the Belt and Road Initiative (BRI). I appreciate the importance that the UK places on the BRI. The British Government has appointed a special envoy and set up an Expert Board for BRI. I am pleased that Sir Douglas is with us today. He is the special envoy who chairs the Expert Board for BRI. Recently, the British Parliament set up the new All Party Parliamentary Group on the Belt and Road Initiative. We welcome the British Parliament’s initiative. In the British business community, the interest and enthusiasm for BRI is running high. As Chancellor Hammond said, Britain is a “natural partner” for China in advancing the BRI. As a “natural partner”, Britain has “natural advantages”. The City of London is a world financial centre. This is an important advantage. 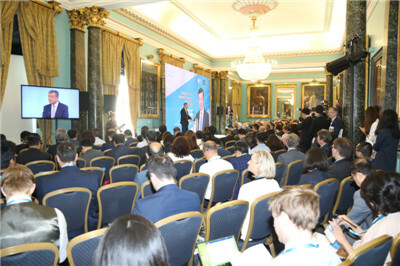 It enables the UK to play an important role in promoting financial connectivity along the Belt and Road. Specifically, it can provide investment, financing, and financial services such as agent banking relationship and syndicated loans for the BRI. The UK is the birthplace of common law. This is another advantage. With mature legal and consulting expertise, the UK can provide professional services and legal support for the Belt and Road projects. Moreover, the UK has close relations with many countries along the routes. This may be the third advantage. It could create opportunities for China and the UK to work together to explore a third market. This ancient wisdom on the importance of openness and inclusiveness are very much relevant today. It is openness and inclusiveness that have set the stage for multi-lateral trade. 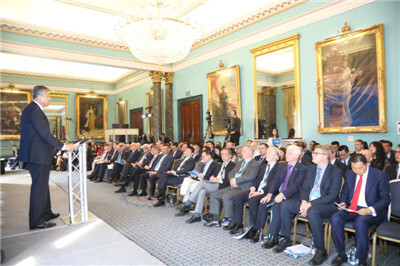 It is openness and inclusiveness that have laid the foundation for the China-UK “Golden Era”. Regardless of how the international landscape may evolve, China will continue to uphold openness and inclusiveness. China will open up to the world with a wider scope, in greater depth, and at a higher level. China stands ready to work with the UK to enhance openness and cooperation in the world economy and to build a community with a shared future for mankind! In conclusion, I wish this Symposium success.